Makes 9 filled éclairs. Takes 2 hours, plus baking and cooling time. Make the pistachio paste: Cover the pistachios with boiling water, and leave to soften for 5 – 10 minutes, whilst preheating the oven to 150 degrees. With a clean tea towel, rub the skins off the pistachios, leaving them bright green. Weigh out 70g of the skinned pistachios, spread out on a baking tray, and bake in the pre-heated oven for 10 minutes. After ten minutes, tip the hot pistachios and the icing sugar into a food processor and blend until they form a paste. If needed, add the water, 1 tsp at a time, to make the paste. Make the Crème Pâtissière: Pour the almond milk and 2 tbsp of the pistachio paste into a thick bottomed sauce pan, and heat slowly until almond boiling. Meanwhile, in a heat proof bowl, whisk together the sugar, eggs and cornflour. When the milk is almost boiling, slowly pour over the eggs whilst whisking constantly until all the milk is incorporated. Pour the creme pat back into the saucepan, and slowly heat until thickened. When thickened, pass through a sieve, and then beat in the butter until melted. Cool in a bowl covered with clingfilm to stop a skin from forming. Make the choux pastry éclairs: Preheat the oven to 200 degrees. Sift the flour onto a piece of paper or plate (this is important as it allows you to get the flour into mixture quickly). Put the butter and water into a saucepan. 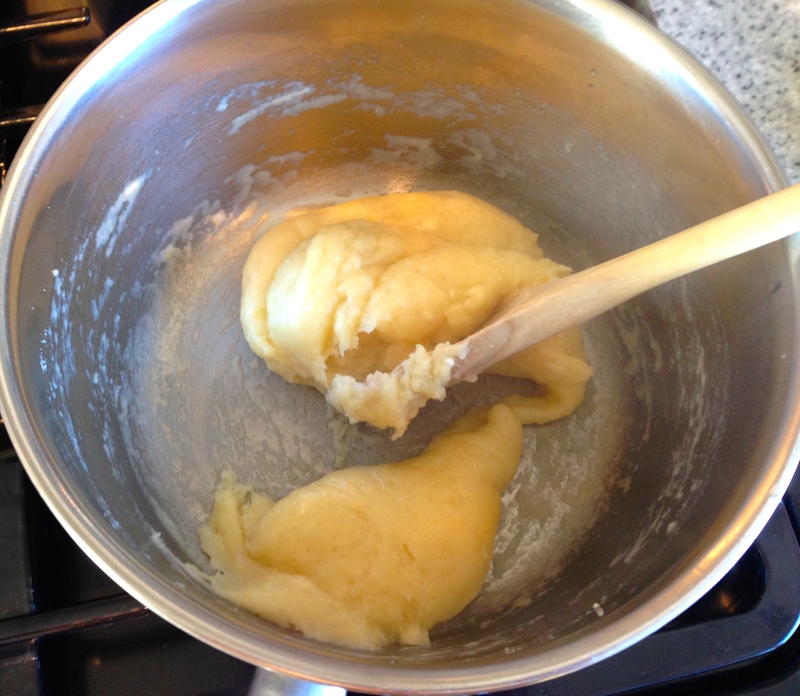 Heat gently until the butter has melted – it is key to try not to evaporate too much of the liquid. Tip the flour into the liquid and beat thoroughly with a wooden spoon. It will start by looking like bad scrambled eggs, but keep going for about 3 minutes until it becomes a smooth ball. A film of dough will stay on the bottom of the pan. Leave the dough to cool for a few minutes, until you can no longer see much steam coming off from the pan. Beat in the eggs a little at a time. This is best done in a free standing or hand held electric mixer unless you have incredibly strong arm muscles! You know the mixture is done when the dough has a dropping consistency – like cake batter. Test this by dropping some off a spoon – some should fall easily, with the remaining dough leaving a V shaped trail from the spoon. On a large piece of baking paper, mark 9 9cm lines spaced well apart. Fix it down to a large baking tray using a little dough in each corner. Fill a piping bag with the choux pastry and using a large plain nozzle, pipe long eclairs, cutting each one off using a sharp, wet knife. Use a wet finger to smooth any sharp edges down, and then spray the eclairs with water. If you don’t have a water spray bottle (I don’t! ), make your hands wet, and then shake them all over the pastries. Bake in the preheated oven for 30 – 35 minutes until golden and crisp. Remove to a wire rack, and use a sharp knife to cut a slit in the side of each one to release the steam. Leave to cool completely. Assemble: When the eclairs are cold, make the chocolate glacé icing by combining the icing sugar and the chocolate paste together in a shallow bowl. Add more water to get to a thick consistency that coats the back of a spoon. Whisk the creme pat for a few minutes using a free standing or hand held electric mixer until light, and then fill a piping bag with the nozzle of your choice. Cut each éclair open in half, on the bottom half, pipe the creme pat as wished. Carefully dip the top half of the eclair into the icing, and place on top of the creme pat. Sprinkle over roughly chopped pistachios and flaked almonds if wished. Serve within 1 hour.